I’ve had a chirp in turbo for about a month, starts as soon as turbo starts engaging and then becomes high whine, hasn’t changed characteristics since it started. Anybody addressed this on theirs? Chunkka gunkka caught in your turbine wheel? It's more common though, for the leading edge of the compressor wheel to erode. Lot of that happens around here with all the diesel toy haulers heading to the sand dunes every weekend, and the fine talc sand erodes their compressor wheel blades. They all get funky sounding whistles and chirps eventually until they're rebuilt or changed out for something else. 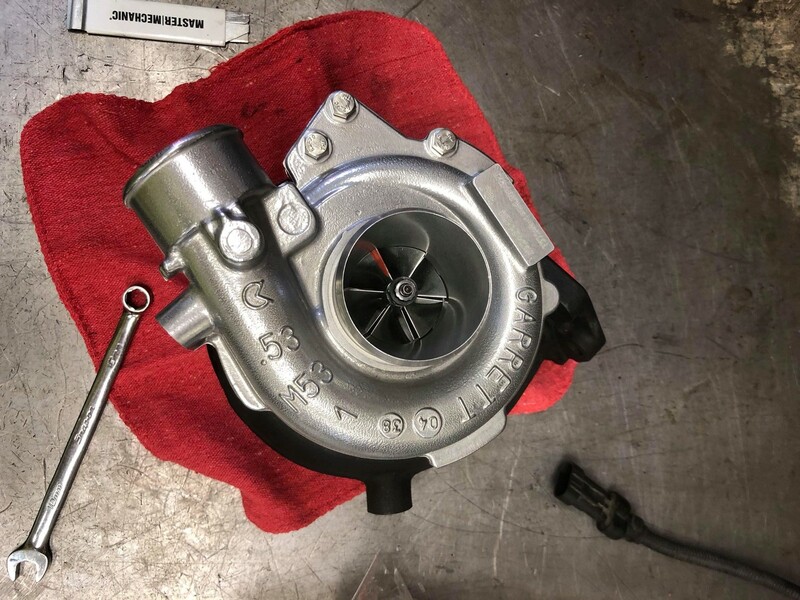 You might be needing a new turbo. Pull off the turbo inlet hose and check for holes or tears. Stick your fingers in the turbo and try to wiggle the shaft. Inspect your boost hoses for cracks and leaks. Are you sure the chirp is coming from the turbo? Could be the belt or pulleys. Thanks, definitely the turbo making the noise, I’ll check hoses and such, I have a new turbo sitting on the shelf if needed. I’ll update with results..
Chinese import no doubt @ 148 bucks.. they do claim it's 'balanced'..
11-5-14 gen II FH installed. Budget?? Sure! 'Everything I have'. I offer a performance rebuild on these turbos. They are internally updated to the newest style turbine, vanes, and billet compressor wheel, along with a bigger thrust bearing for better longevity. Spool time is drastically reduced and airflow through the engine is improved across the entire range. Easily supports 250hp smoke-free. 05 Liberty Limited CRD, converted to KPA 2863 ball bearing and billet turbo, 50hp injectorsl, complete egr delete, cooling fan delete, weeks intake kit, cummins in tank lift pump, ARP studs, 3" turbo back exhaust, samcos, etecno plugs, GDE trans tune, custom GDE engine tune.